There are a few genres for which the ebook novella seems perfectly suited, and Star Trek stories is one such genre. Though a fan of the Star Trek universe, I was not really a fan of the Deep Space Nine series in particular, and primarily because of the Ferengi characters. This book deals almost solely with the Quark, Nog, and the Ferengi culture so I wasn’t expecting to enjoy it. But I went in with an open mind (or tried to) and found the story to be rather interesting. Quark has a new scheme to legitimately have his bar classified as a Ferengi embassy. To draw attention to his embassy, he needs something to capture people’s attention and what better way to do it than to bring to his bar …er, embassy …a very rare, original Ferengi document: the original scroll of the Ferengi Rules of Acquisition. But when the scroll arrives, there’s a little bit of a problem … this ‘original’ document is a fake. Quark tries to enlist Constable Odo’s help, but since the bar is now an embassy, it’s considered foreign soil and Odo doesn’t have any authority there. Quark is on his own. The book is just the right length for this sort of story. Authors Paula M. Block and Terry J. Erdmann don’t dwell too much on the greediness of Quark, but use it as a catalyst for a little mystery. Especially for someone such as I, who doesn’t care for Quark or the Ferengi characters, this novella provides some decent Star Trek escapism, even with unlikable characters. It really is a Quark story. Other than Odo, who only makes a cameo appearance, we don’t get any tie in to any other DS9 characters, but that’s fine … it would only have drawn the book out. I’ll read just about anything from the Star Trek universe, but I was leery going in to this one and was pleasantly surprised at a nice little story. Looking for a good book? 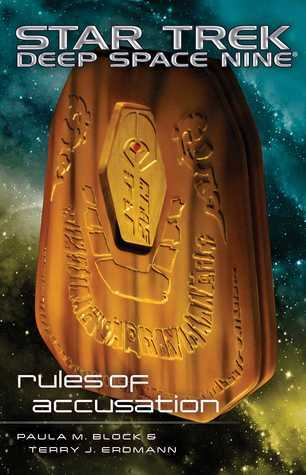 Rules of Accusation is a Star Trek: Deep Space Nine novella by Paula M. Block and Terry J. Erdmann that features Quark and some Ferengi history, but even if you aren’t a fan of the characters, this story reads nicely.